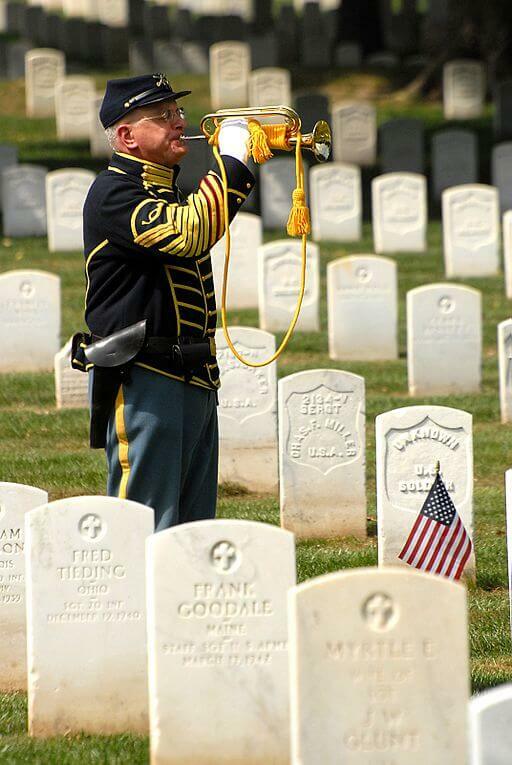 Taps was first performed at Civil War burial ceremonies in 1862, but its origin and authorship of the music and its lyrics remain unverified. The tune might have been written and found in the pocket of a dead Confederate soldier by his father, a Union Army infantry officer, who asked that it be played at his son's funeral. Union Army Brigadier General Daniel Butterfield is the more likely source of the current tune, first played by his bugler, Norton. Union artillery Captain John C. Tidball ordered it first played at a soldier's burial, a safer alternative to the three volley tribute, which would have given away the unit's hidden position to the Confederates. A lesser-known legend for its naming is that Lieutenant William Waid paid saloon-keepers to shut off the taps to the kegs when the song was played in a neighboring army camp. The lyrics might have been composed by Horace Lorenzo Trim, but that's also unverified. Suffice it to say the solemn tune and its lyrics pay tribute to all fallen American soldiers, past and present. Always true to the promise that they made. To thy hands we our souls, Lord, commend. Featured in our collection of American Patriotic Songs. Visit American History and Civil War Stories for literature that helped shape the country. Add Taps to your own personal library.